The Ana Cecilia, a 300 foot ship that can hold 16 containers of supply, sailed from Miami into the Cuban harbor of Havana Bay shortly after 7 AM local time yesterday and brought with it humanitarian goods from relatives in the United States. I found it interesting to learn that many kinds of humanitarian aid can be sent from those exiled including vehicle parts, generators, construction materials, food, medicine and medical supplies including orthopedic mattresses which was included on this, this maiden voyage. 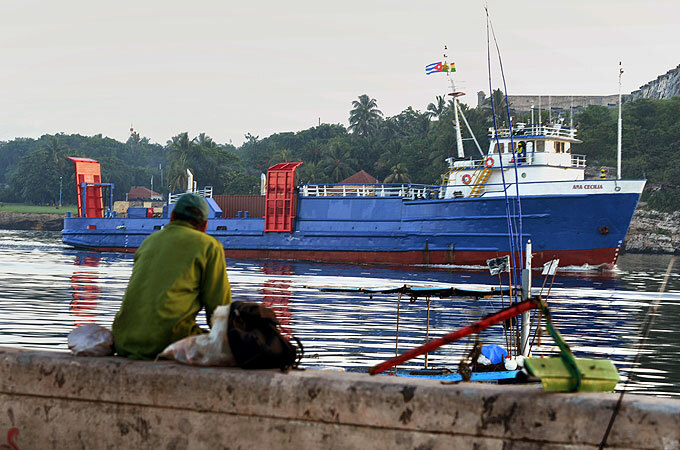 Shipper, International Port Corp. was granted a special permit from the US to begin trading and will try to make this a weekly service every Wednesday between the US and Cuba. The trip between Miami and Havana is only 16 hours but this particular trip seemed like a lifetime in the making. In fact, for those born after 1961 it has been a lifetime. International Port Corp. spokesman Leonardo Sanchez-Adega stated "This is so wonderful," after the ship finally docked following a delay of several hours due to an error in customs paperwork that was submitted to the Cuban authorities. Cuban born Congresswoman Ileana Ros-Lehtinen states that the Ana Cecilia is in violation of the Helm-Burton Law which requires all trips that travel to Cuba to wait 180 days before they can touch American shores. She has strongly criticized this trip. Congress has looked at embargo issues for quite some time but President Barack Obama has taken the first step by easing some travel restrictions and allowing Cuban Americans to send unlimited remittances (financial transfers) to relatives still in Cuba. Since roughly 1.2 million displaced Cubans now live in America this is extremely significant. Although remittances, humanitarian aid and some travel have been eased their are still hurdles in both the US and Cuba that need to be jumped. Less than three years ago,in December 2009, Alan Gross, a US contractor with Development Alter, was arrested by Cuban Police for distributing laptops and communications equipment to members of Cuba's small Jewish community under a US State Department contract. Gross was accused of being an American Spy and that he was setting up a communication infrastructure for Cuban dissidents. He is now serving a 15 year prison sentence at Havana's Villa Marista Prison. His arrest, and the arrest of others has created serious strains in American Cuban relations. Pope Benedict XVI weighed in on the embargo in March by stating, "May no one feel excluded ... from taking up this exciting search for his or her basic freedoms, or excused from this by indolence or lack of material resources, a situation which is worsened when restrictive economic measures, imposed from outside the country, unfairly burden its people," the pontiff said. The embargo has not worked. It is time to allow all Americans to visit and trade with Cuba...that is how change will be made and when I will finally be able to munch a real Ropa Vieja. C'mon Congress, I am hungry! For more posts please visit Barry Seward Presents. Good start I would have liked to be there to see it. If this is start please don't stop. Keep republicans out of WH. Could this be the change I have waited so long to see in America ,Would wait to see.